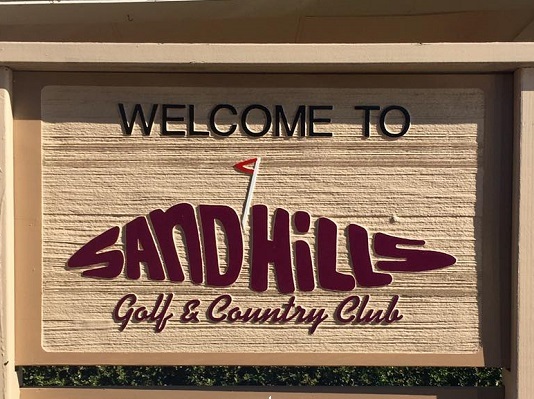 The 9-hole Sand Hills Golf & Country Club located in Campbell, Texas opened in 1962 and features 6, 090 yards of golf from the longest tees for a par of 36. Two holes stand out on the par 36 layout “the 270 yard, par 4 No. 6 and the most difficult hole, the 220-yard par 3 No. 8. Hole 4 is the best birdie opportunity, a 470-yard par 5 that should definitely be reached in two if you’re hitting them well. Two sets of tees allow for an 18-hole round. On the weekends, the course is open only to members between 11 a.m. and 3 p.m. In addition to the golf course, the club house offers a full service bar, an outdoor patio, and swimming pool. Special events are scheduled weekly including a Tuesday and Thursday night golf and food special ($20) and Red’s Wednesday night Scramble. The Friday lunch special offers a nice option for lunch at an unbeatable price.